Hello and welcome to the 687th installment of the SWD. Hayat Tahrir al-Sham announced that Al-Ghawaziya crossing between Idlib and Afrin will be reopened tomorrow. The reopening comes at the request of Afrin residents, while the other two crossings between the regions will remain closed until further notice. Left over Islamic State’s improvised explosive device killed a civilian in the village of Jdoua in western Raqqa. Unknown gunmen wounded an element of Hayat Tahrir al-Sham in Maasran, south of Idlib. 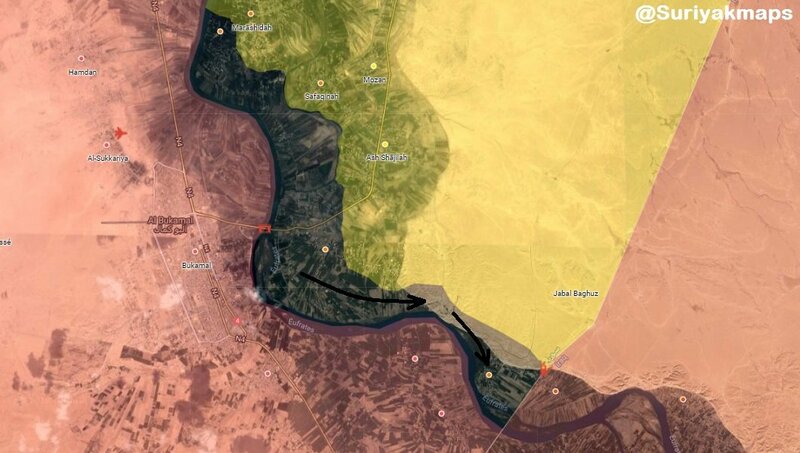 Islamic State allegedly made further advances against the Syrian Democratic Forces on Baghouz al-Fawqani front. However, these reports remain unconfirmed for now and should be treated as such, until the dust settles and situation clears. Afghan National Security Forces killed two and wounded two elements of the Islamic Emirate of Afghanistan (Taliban) in Andkhoy district. Three elements of the Afghan National Security Forces surrendered to the Islamic Emirate of Afghanistan in Chushma Dozak area of Sang Atish district. Afghan National Security Forces killed two and wounded four elements of the Islamic Emirate of Afghanistan in Arghandab district. Afghan National Security Forces reportedly killed 25, wounded two, and arrested four elements of the Islamic Emirate of Afghanistan, as well as destroyed three vehicles and four motorcycles in Nahri Saraj, Jerashk, and Sangin districts, according to the Afghan Ministry of Defense. Afghan National Security Forces reportedly killed 24 and wounded six elements of the Islamic Emirate of Afghanistan in Shah Wali Kot and Maywand districts, according to the Afghan Ministry of Defense. Islamic Emirate of Afghanistan’s snipers killed two elements of the Afghan National Security Forces in Sara Sakhar area of Shah Wali Kot district. Hey Josko. I think you need to correct your report and stop relying merely on social media reports> A lot of people have been using a Euphrates Post report showing images of PMU shelling an area near a mountain. Based on that they derived the theory that Tahtani has fallen and ISIS counterattacked. However Euphrates Post did not claim it was Tahtani, only baghuz twon and looks mre like a farm since the soil is dug in a way that farmers use to plant seeds. There are also very few houses. Looks like the outskirts of Baghuz. See this (https://twitter.com/EuphratesPost/status/1091377184479039489). Also none of the local Syrian news sources say ISIS counterattacked. Step News Agency said no real changes happened yesterday (https://stepagency-sy.net/archives/225599). Also SOHR said hostilities are still paused between SDF and ISIS since start of an unofficial ceasefire. No reports of attack on Baghuz (http://www.syriahr.com/?p=306314). Use Google Translate as these news reports are in Arabic for now, will paste an English one when they upload it. Hey Gunthaman, the report will be corrected removing the part about advances on Al-Baghouz al-Tahtani, and the part about Al-Baghouz al-Fawqani will be marked as alleged for now. There are cases, such as this one, when there is a lot of conflicting information floating around, which makes it hard to distinguish between factual and unfactual information. Thank you for your feedback.